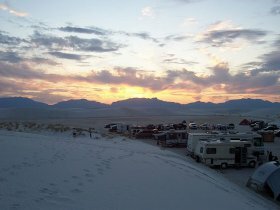 Welcome to the White Sands Star Party Website! COME TO THE WHITE SANDS STAR PARTY AND EXPERIENCE SOUTHERN NEW MEXICO’S DARK SKIES! The White Sands Star Party is an annual event held at the White Sands National Monument. This event is a special opportunity for registered participants and their families to enjoy stargazing under dark New Mexico skies, and camping in the unique and wonderous setting of the world's largest gypsum dune field. A special public viewing is an opportunity for everyone to view through a vast variety of telescopes and equipment provided by the participating amateur and professional astronomers. Guest speakers, and special daytime events are made available as part of the experience. Please visit the links on the left of the website for details. The White Sands Star Party benefits those teaching the science of astronomy. This event will support STARS (Students and Teachers Achieving Real Science) Grant Program. A beautiful dark sky, glistening white sand dunes and visits to two outstanding national observatories await you at the annual White Sands Star Party. Amateur Astronomers will participate in two days of special activities, and two nights of great observing deep in the heart of the Dunes. Hosted by the New Mexico Museum of Space History, White Sands National Monument, the Alamogordo Astronomy Club, and the Astronomical Society of Las Cruces. The White Sands Star Party not only provides participants with the opportunity to meet and visit with other astronomers, but to share astronomy with the public on Saturday night. Only registered participants are able to camp out in beautiful white gypsum dunes and view the sky all night! There is plenty of room for RV’s, Trailers and Tents. Generators may be used from noon to 3:00 PM each day. Daylight activities for participants include mini-workshops designed to enhance your knowledge and skills in several areas, a visit to the NM Museum of Space History and Imax® Dome Theater. So register now, and come to White Sands National Monument for a weekend of astronomy with old and new friends. White Sands National Monument serves as the official event host. It is the largest gypsum dune field in the world. Click on the hyperlink or blue bar graphic for a detailed outline of atmospheric conditions in and around White Sands. A special thanks to Attilla Danko for development of this module. Click on the Sun images for high resolution detail on current solar activity and additional reference material. Click the link or image for additional resources about the moon.